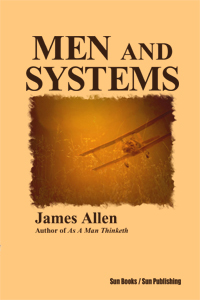 MEN AND SYSTEMS by James Allen. Men and Systems, Work, Wages, and Well-Being, The Survival of the Fittest as Divine Law, Justice in Evil, Justice and Love, Self-Protection-- Animal, Human, and Divine, Aviation and the New Consciousness, The New Courage. 149 pgs. 5x8. Pbk. ISBN: 0- 89540-326-9.